Tuesday Tutorial… Organizing your space! Happy New Year, card-makers! We’re off to another great year of card-ing… Will 2012 bring another million cards??? If you’re anything like me, you love to start fresh sometimes, with a clean, organized craft space… Maybe reorganizing your area helps you remember supplies that you meant to use or helps you make a list of things you will need for the year. Maybe sorting through the paper and stamps helps get your muse in gear? Our very own Jen Mueller from The Sparkle Within has generously offered up this fantastic tutorial on Organization! Stop by her blog and leave some love, won’t you? 1) Purge is NOT a four letter word. For some people, purging is GREAT. It’s freeing and liberating and for others, the very idea makes one shiver and rush for your stash to hold on tight! If your heart is beating a little faster at the thought of getting rid of some things, consider this: how often do you use those things in your craft space that you don’t really like – that tool that never works quite right, the paper that you bought a year ago but haven’t used yet, those stamps that you thought were just fabulous but you’ve never ever inked? My guess is you shove them (literally or mentally) to the side and reach for the things you do love. This year, I encourage you to embrace the things you love and let go of those things you don’t. Sell or donate those things (if this seems impossible, pick 10 things you never use. Put them in a bag and stash it out of sight. Make a note to find the bag in 3 months. Do you even remember what’s inside? Let ’em go.). What you have left is what you will USE. That is a good thing! 2) Know yourself and your space. Embrace your space. We’d all love a big, spacious room with custom-built storage for crafting. Unfortunately, most of us aren’t nearly that fortunate! Look at what you do have and go with it. 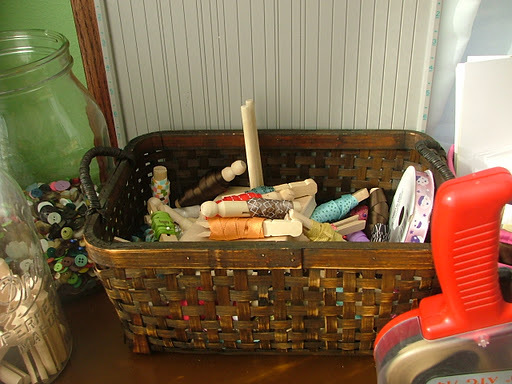 Whether you have shelves, drawers, or plenty of space for a big table – experimenting with boxes, baskets, and peg or bulletin boards will keep your stash in order. I spent about $10 on the wooden clothespins, but I had plenty of pins from my sewing stash and the glass jars I was able to get free from my local Freecycle group since I didn’t need lids. The very BEST part is that this system really works well for me. It keeps everything contained and I can SEE my ribbon, so I am using it! 3) Find your organizational tools. There are lots of things that most of us have in our homes that could easily work as storage tools. 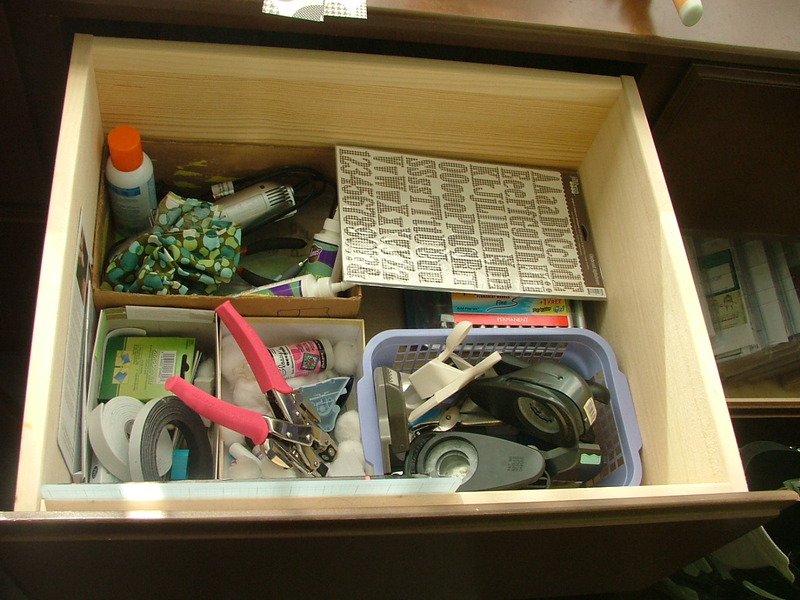 I have really deep drawers in my craft space, and if I just toss stuff in, it gets jumbled up and I spend more time looking for things than crafting! My solution is super easy and cheap: shoeboxes! 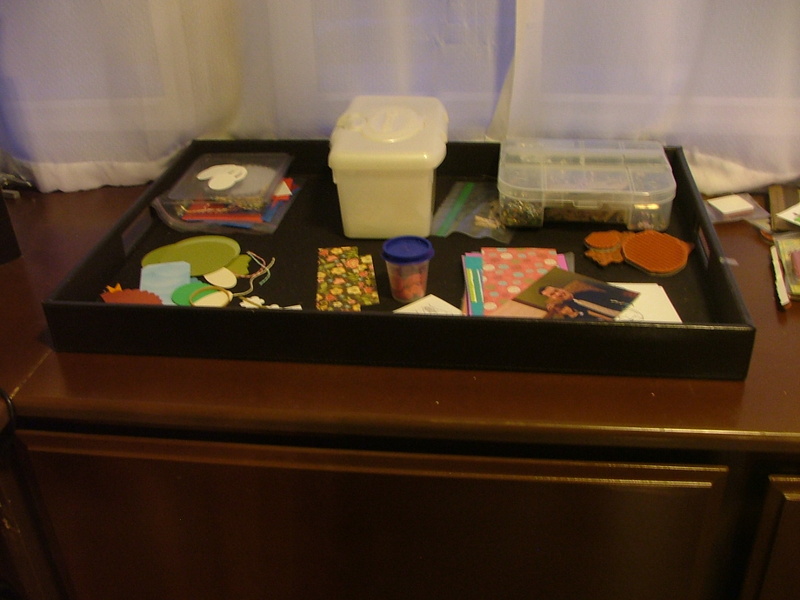 I arrange them in the drawers to hold adhesives, punches, embossing tools, and more! Think about how you can repurpose things for storage – empty plastic containers, shoeboxes, jars, and boxes can all be ‘prettied up’ to become storage on your workspace or left plain and functional to work inside drawers or containers. If there is a specific solution you are looking for, thrift stores or Freecyle and Craigslist are good resources. 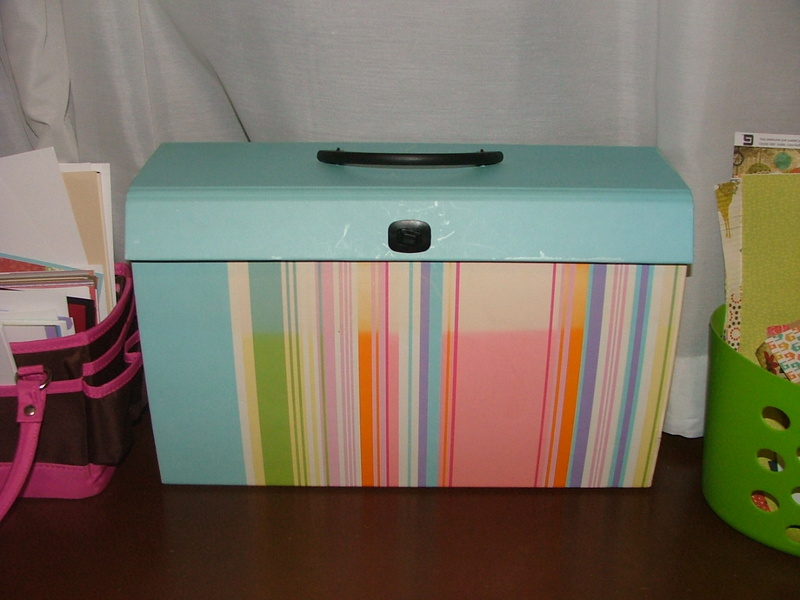 I found this great file folder box at my Goodwill for 2.99! It locks and has a handle, and has plenty of space for my scraps. On the other hand, I splurge a bit on these Scraponizer cases and file folders because they work SO well for organizing my Unity Stamp collection. If you try something and it doesn’t work, TRY AGAIN. Don’t give up! Now that you’re organized, you have to maintain the calm! 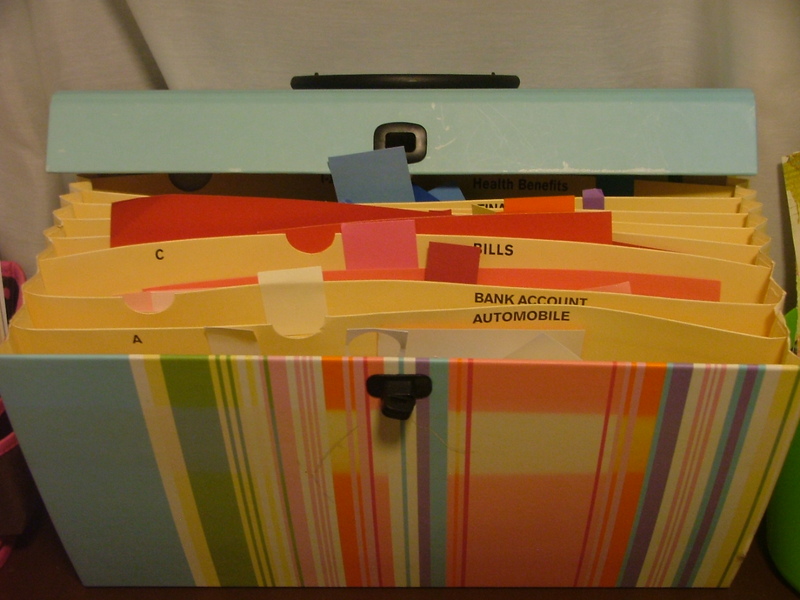 In my opinion, the BEST tip for staying organized and the hardest one to keep is to simply PICK UP after yourself. It is soooo easy to leave out just one or two things. I’ll finish a card and leave my scissors or a couple of scraps out thinking I will use them on the next card and then get pulled away to make supper and before I know it, WHAMMMO! My office is a disaster. I have a couple of strategies to make maintaining my peaceful, calm space a little easier. If I have to leave my things before I get my card done, I use SU clamshell boxes or small baskets to keep the pieces contained until I can come back to it. This way I don’t lose anything, and I have picked up most of what I was working with and usually just need to put away my tools and scraps. Use the 1 in, 1 out rule – if I get a new embossing folder, I have to go through my folders and sell/give away one. This is a good way to curb impulse buying! Dedicate 5-10 minutes every day (or 2-3x/week) to picking up and fine-tuning your space. Even if I think I have a disaster, 5 minutes is often enough to get most of the job done. Thanks Jen for the awesome tutorial! 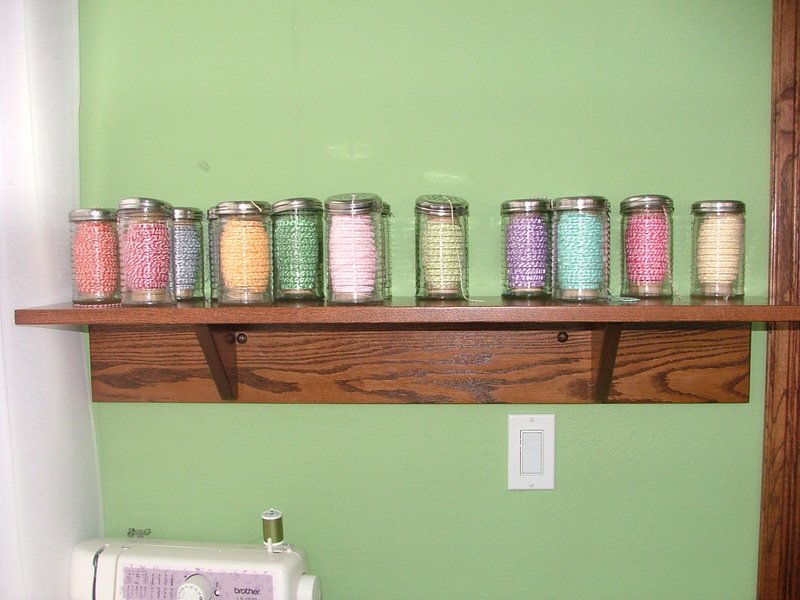 Here is my favorite photo of Jen’s organizing ideas: Twine stored in sugar jars. . . the end of the twine comes out of the hole in the top of the jar for easy cutting, and don’t they look so cute on the shelf??? I love it! We thought it would be fun to use the InLinkz this time to share YOUR organization ideas and skills! Share a photo of your favorite organization products, your unique un-clutter ideas, your paper-filing mastery, or maybe a before / after shot of your space, if you dare! Then… get back to work, your heroes need you!!! WOW–the Tiffany Spaulding FREE craft organizing class starts today online–what perfect timing. I signed up! What a perfect complement to this great tut–thanks!! This is a fantastic post! This year I'm dedicating myself to passing on or selling items I don't or haven't used and to using up all or at least most of all the supplies I've accumulated before I buy anything else that's not a necessity (like adhesive). I think one of the very best pieces of advice here is "If you try something and it doesn't work, TRY AGAIN". Thanks for the great tutorial! I don't have a blog, but love to organize! Thanks for the ideas! Great tutorial, at my house it's time to purge again! I loved all of Jen's great ideas! LOVE the ribbon "popsicle" on a clothespin! 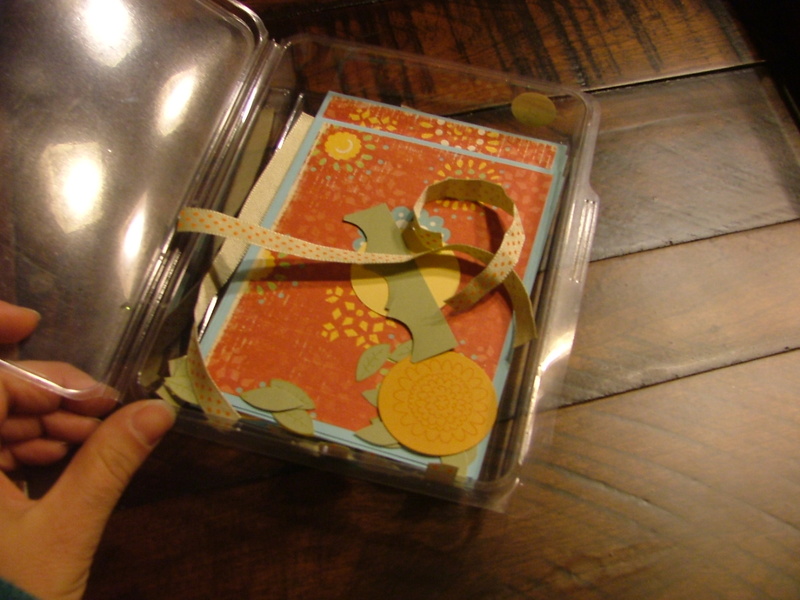 I use rectangular plastic Restaurant Take out containers with tight lids for card project storage. They "stack" for storage, and are air-tight (waterproof) for travel. Thanks for all these great ideas that might help me make the most of my tiny space. I am green with envy of all the beautiful craft rooms shared here. But I may share an idea I've found that helps me in my small workspace, if I can get a decent photo to post.